Convening in neither of the three countries, Canadian, Mexican and United States leaders signed an updated North American Free Trade Agreement on Friday in Buenos Aires, Argentina, hoping to modernize the two-decade old treaty that transformed the Rio Grande Valley. Military Highway in South McAllen hardly had any business in the 1990s, but now is lined with large distribution plants and has a bustling produce terminal, which many leaders in the region have said is a result of NAFTA. President Trump, who threatened to scrap the agreement altogether during his presidential campaign and once he was in office, eventually came to an agreement this fall with his North American counterparts after a year of negotiating rounds in the three countries. 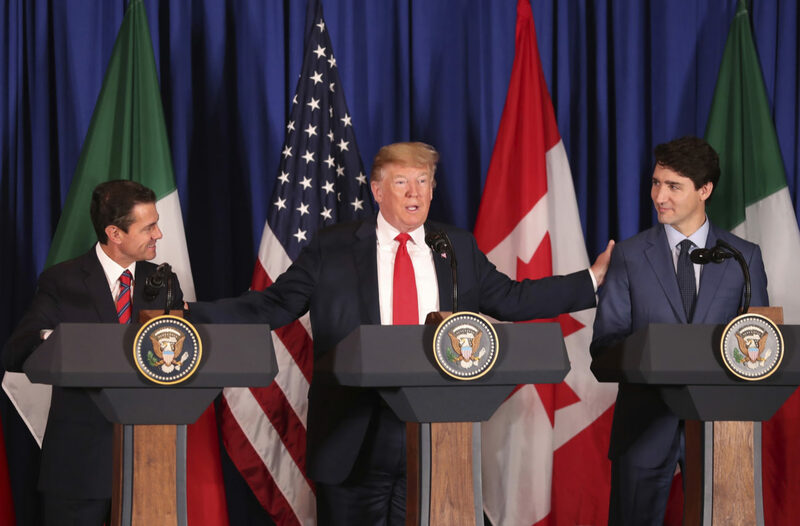 Trump appeared alongside Canadian Prime Minister Justin Trudeau and Mexican President Enrique Peña Nieto to formally wring in the deal on Friday, Peña Nieto’s final day in office. Trudeau did not join his peers in holding up a binder to celebrate the new deal. “The terrible NAFTA will soon be gone,” Trump wrote in a Tweet on Friday. Trudeau also deliberately did not call the agreement by its new name: the U.S.-Mexico-Canada-Agreement, which still needs Congressional approval. While Trump seems to be eager to check the box of getting a new trade deal, and a new name at that, some in South Texas have not been as eager to call it a totally revamped agreement. In fact, the region seemed to be encouraged that the deal was not severely changed, since it has resulted in positive change for the Valley. I think this whole re-negotiation period put a lot of money on the sidelines, a lot of money that would’ve went to the maquilas,” said Salvador Contreras, an economist who runs the Center for Border Economic Studies at the University of Texas Rio Grande Valley. Businesses in the trade industry have dealt with an unclear future since Trump took office, analysts said. “This adds certainty to the agreement, to the region and, really, to the countries. And certainty adds investment to our community,” said Sergio Contreras, who heads the Rio Grande Valley Partnership, an organization that seeks to grow business in the region. Contreras will also be the next president of the Border Trade Alliance, so his attention to trade has increased. However, trucks have continued to criss-cross the Pharr-Reynosa International Bridge by the thousands each day, making it the largest produce port of entry in the U.S., which brings Pharr more than $12 million annually. But produce wasn’t a large component of the new trade deal. The agreement didn’t touch on infrastructure at the ports of entry, which bridges, and their surrounding areas have placed a lot of attention. “To keep improving, we need our region to be engaged,” Sergio Contreras said. The Congress in the U.S. and Mexico still need to approve the deal, which could present some hurdles with new majorities in the Mexican legislature and in the U.S. House of Representatives.